Ahura Mazda, whose name means "wise lord," was the most important god in ancient Persian mythology. When the religion known as Zoroastrianism became widespread in Persia around 600 B . C ., Ahura Mazda became its supreme deity. The Persians considered him to be the creator of earth, the heavens, and humankind, as well as the source of all goodness and happiness on earth. He was known to later Zoroastrians as Ohrmazd. Ahura Mazda appears in Persian art and texts as a bearded man wearing a robe covered with stars. Dwelling high in heaven, he had the sun for an eye. In the Zoroastrian religion, Ahura Mazda was associated with light and fire, the emblems of truth, goodness, and wisdom. He created six divine beings, or angels, to help him spread goodness and govern the universe. One of the most important angels was Ahsa Vahishta ("Excellent Order" or "Truth"), the patron of fire and spirit of justice. Vohu Manah ("Good Mind") was a symbol of love and sacred wisdom who welcomed souls to paradise. Ancient Persians associated the god Ahura Mazda with royalty, as well as with light and fire. 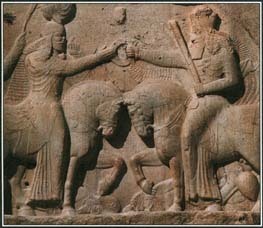 Darius I believed that Ahura Mazda had made him king. In this stone relief, the god gives a crown to the Persian king Ardechir I.
enemy was his twin brother, Angra Mainyu (also known as Ahriman), the god of darkness, anger, and death. Later Zoroastrians considered Ahura Mazda to be the more powerful force, who would ultimately triumph over the evil Ahriman. See also Ahriman ; Angels ; Persian Mythology .